Bomber jackets seem to never go out of style, but this staple jacket had a major fashion moment in 2017. I noticed a surge in mens bombers last year - no surprise, men and bomber jackets go hand-in-hand. In the 50's, this military style (bomber style) jacket made it's way from, well, men in the military to the streets. Bombers made another comeback in the 90's. In 2018, the rebellious fashion attitude has the bomber momentum going strong again. The bomber jacket is the perfect season transitioning outerwear. Light-weight jackets and layers are suitable for the in-between season. You can pair the bomber jacket with anything - really! Casual looks, day dresses AND even more elegant looks. The bomber adds a roughness and contrast to the 'all dressed-up and goin' somewhere special look'. This urban style jacket is relaxed and evokes a 'cool' vibe. This Spring, relaxed fit and oversized bombers with graphic logos across the back are on-trend. Yeah, you can opt for the traditional military green, camo and navy fabrics, or you can add a little intrigue as you're walking away. 'You thought I looked good from the front - wait till I turn around'! Arm patches, appliqués and embellished zipper pull tags make this long-time staple jacket modern again. 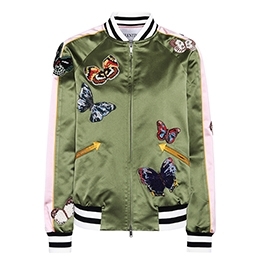 This silk Valentino bomber jacket (available at Mytheresa) is everything (really, there's a lot going on here)! I love the pale pink stripe with yellow piping along the shoulders and sleeves. The contrast against the olive green satin is perfect. The black and white ribbed trims are traditional and chic. The color combination is genius. The beaded and embroidered butterfly appliqués on the front, back and sleeves are gorgeous. Truly amazing! This reinvented bomber jacket is my favorite this season. The collegiate varsity inspired Miu Miu appliquéd satin-shell bomber jacket (available at NET-A-PORTER) is sporty and fun. The red and white bouclé 'M' patch and glass-beaded flamingo add a playful vibe to the muted shades navy and antique-rose. This relaxed fit bomber jacket has snap buttons and ribbed trims. 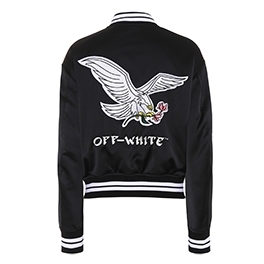 The eagle appliqué on the back of this Off-White satin varsity jacket (available at Mytheresa) is all biker jacket meets bomber jacket. The snap buttons and black and white ribbed trims give this jacket a sporty vibe, while the eagle and flower reference denotes femininity and freedom. 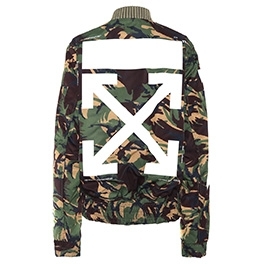 Another one of my favorites - the Off-White camouflage bomber jacket (available at Mytheresa). I LOVE camo and have seen this print up close - it's vibrant and the high-contrast white logo across the back elevates this design. The slouchy fit feels like you're wearing your guys clothes and the O-ring zipper and durable fabrication are the epitome of the bomber jacket. From the Thomas Maier Spring 2018 collection - this duchess-satin bomber jacket (available at NET-A-PORTER) is anything but boring. 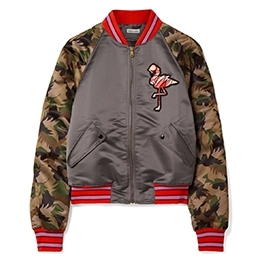 The combination of the gray, camo sleeves, and pink and red striped trims is feminine and fun. The pink flamingo appliqué is cute and girlie. There seems to be many bird references this spring. 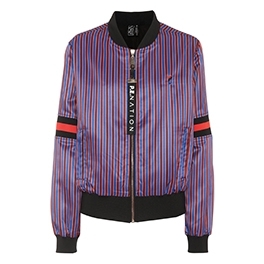 P.E Nation is a athletic clothing brand AND this red and blue striped bomber jacket (available at Mytheresa) will definitely elevate your work-out look. It's a bit 'loud', so I'd opt for an all black ensemble underneath. The toggle zip is branded with the P.E Nation logo and the red stripes around the sleeves are giving me a race-car clothing vibe.